Boil. Fry. Bake – Food, life, and culture. This is such an American staple it’s easy to forget that basically it’s Italian, being noodles tossed with a few readily available ingredients and amenable to being doubled and tripled to feed a crowd. Mac and cheese is so beloved that fancy chefs are sneaking it onto menus, knowing full well it will sell as long as it is not too laden with truffle oil (no, god, no), sherry (maybe a touch) or some other overthought ingredient. Salt, fresh ground pepper and red pepper flakes to taste. Unlike lengthy slow-baked oven recipes involving elbow macaroni and a ton of cheese, this is quick and almost all stove top, except for a 2 minute broil at the end. My trusty All-Clad steel pan heats perfectly. In one pan you’re going to bring water to a boil and then add the pasta. 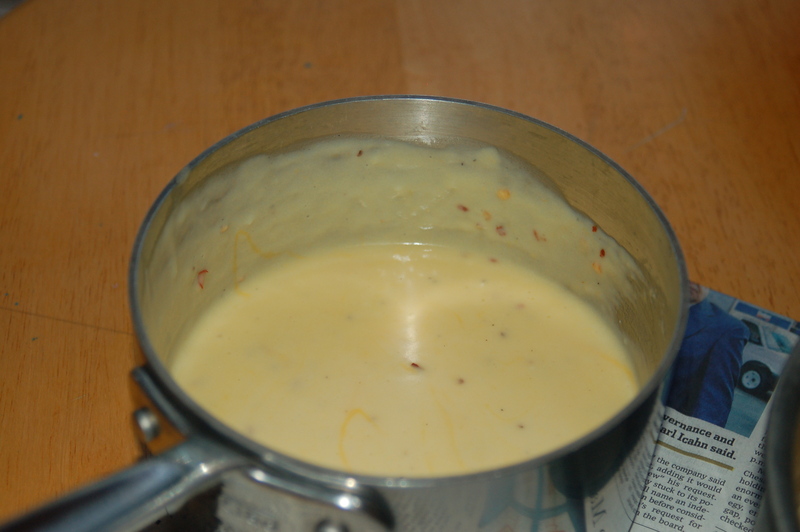 While this is getting done, you’ll make the cheese sauce in another pan. 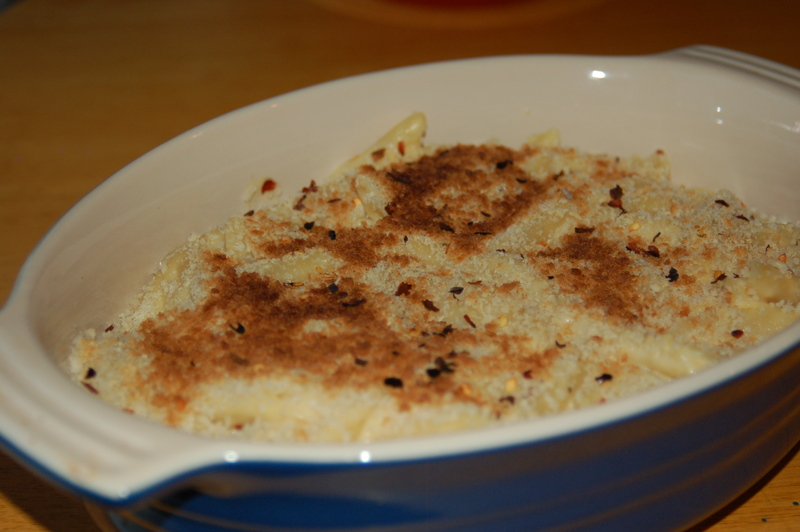 If you were going to oven bake the mac and cheese, you’d want the penne to be al dente so it would not turn to mush in the oven as it absorbs sauce. Not a worry in this case. You’re making a basic bechemel, or white sauce. You melt the butter in a sauce pan at high heat, quickly add the flour, and stir right away so you get a roux. Once you can’t see the flour any more and the mixture bubbles, you add the milk, in two stages. Pour in the first 3/4 cup and lower the stove heat to medium. Use a whisk or wooden spoon to stir and stir. It will thicken gradually (maybe 5 minutes), and then add the rest of the milk. When that’s smooth (it will seem a bit runny and not so thick), add the cheeses. Of course other cheeses you have around, like good swiss or provolone, can work. Just don’t use anything smoked. 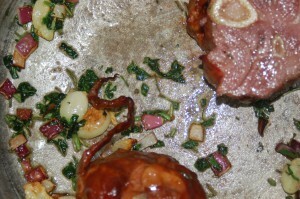 Grind in black pepper, add 1 tsp of red pepper flakes, and a touch of salt. The penne should be done now, so taste one to be sure, then drain it. You can certainly make the pasta way ahead of time and just have it set aside and ready when you do the sauce. Mix the noodles with the cheese sauce, and pour it into a baking dish. 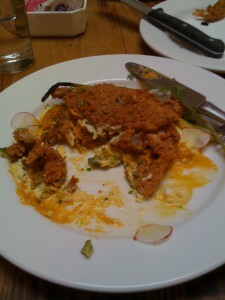 Sprinkle liberally with panko bread crumbs (super crunchy and stand up to heat) and toss on more pepper (black or red). 2 minutes under the broiler, max (watch this like a hawk), and you will have browned bread crumbs. Even better, you will have added the crunch that any creamy, gooey dish needs. 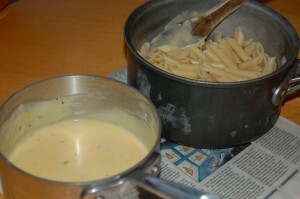 This final stage also well incorporates the cheese sauce and pasta. I tend to re-salt to taste when I dish it up, but I am a salthead. Normal palates like this as is. It’s rare, but if you do end up with leftovers, it microwaves great.